Braids, a hairstyle that has always taken individuality further. In prehistory it was adopted as a way to convey power and status by cultures stretching from Africa to Scandinavia and China. No matter the length, you have a ton of possibilities to show off your creative side via your hair. 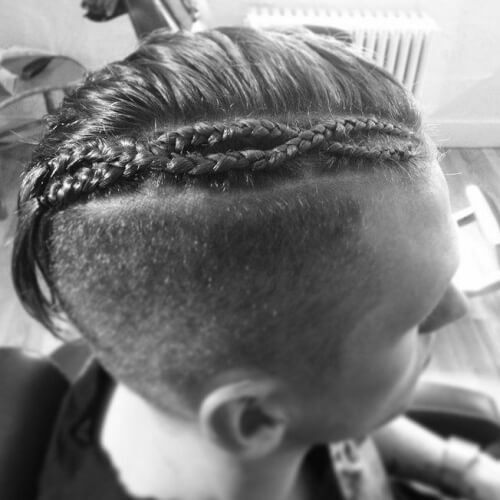 Over the years braids have reached many depths of the world and there’s a style to suit anyone. 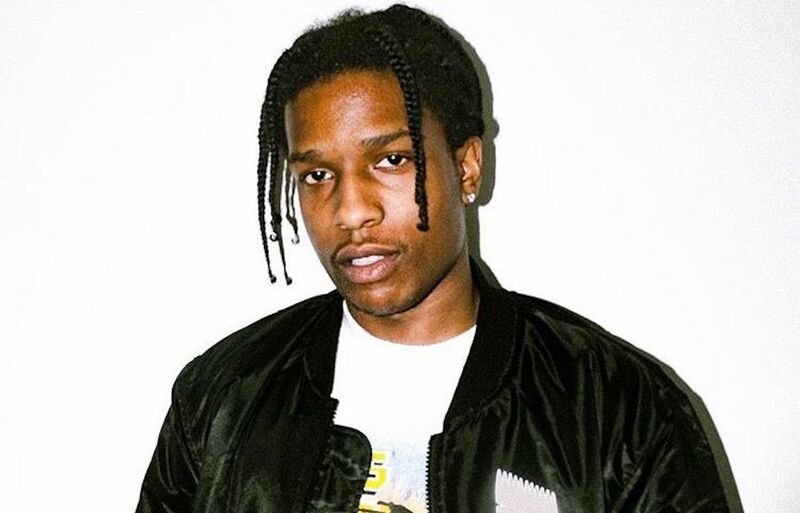 Whether your influence is A$AP Rocky or Viking warriors. 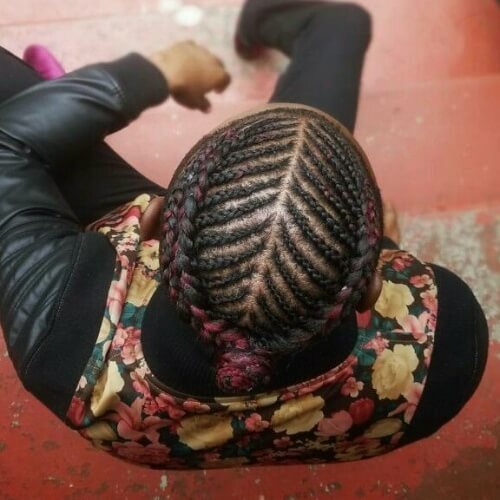 So in this articles we are going to give you 60 braid looks that you can try yourself. 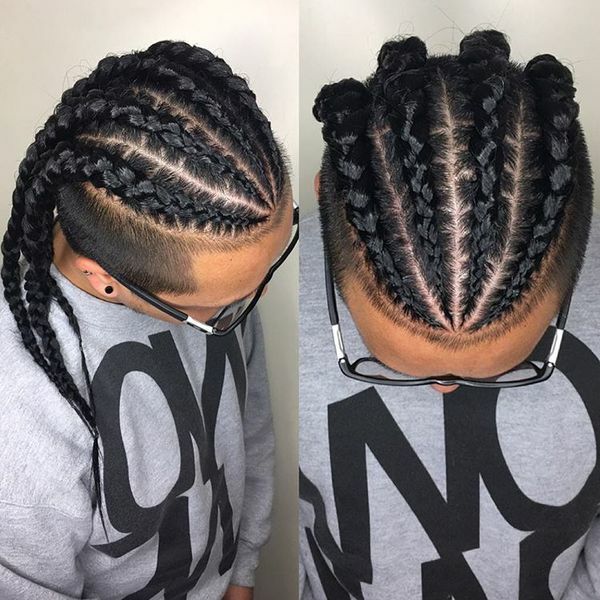 Probably the most popular style for men, cornrows are tight braids worn close to the head. 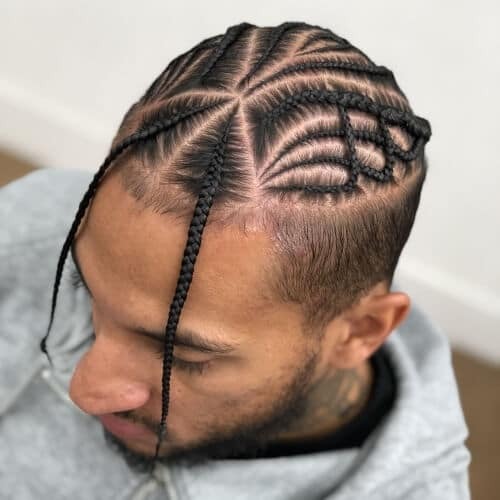 Single plaits or double braids give you the option of playing with texture and barbers can style them as intricately as you dare. 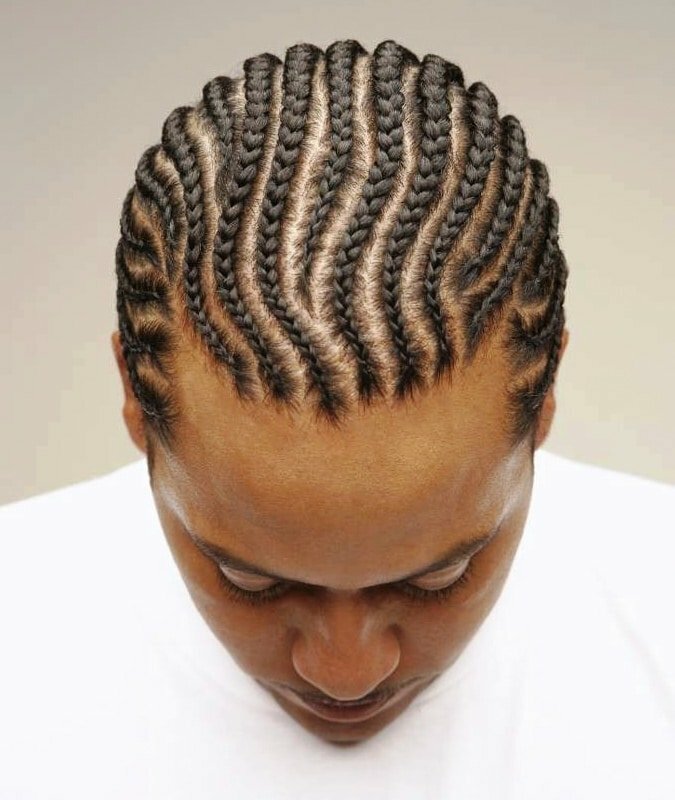 The fuss-free spin on cornrows, these can be ponytailed or left to hang free, depending on your mood. The look’s best with hair short enough that it won’t fall in your eyes. 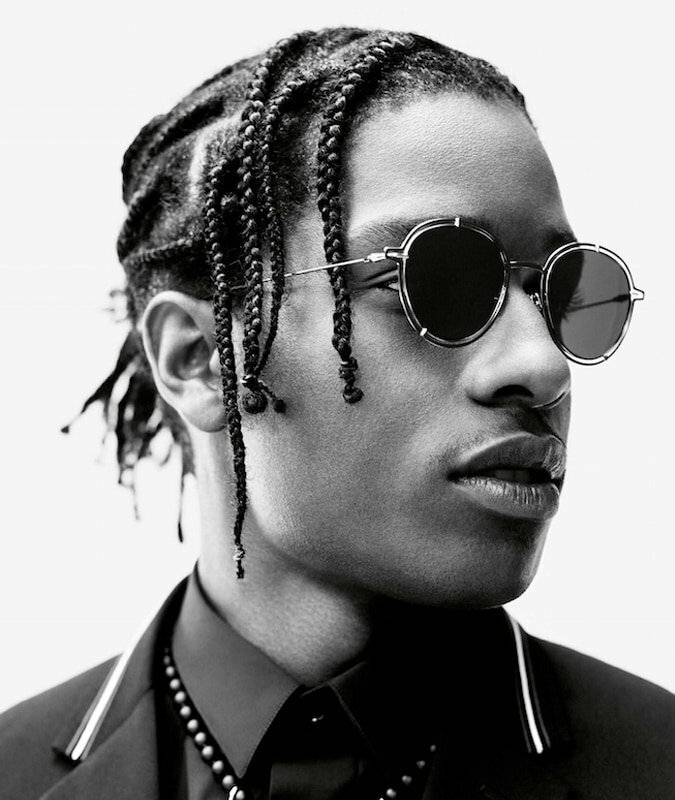 ASAP Rocky Hair sets the trend for many and this look could be ideal for you too. 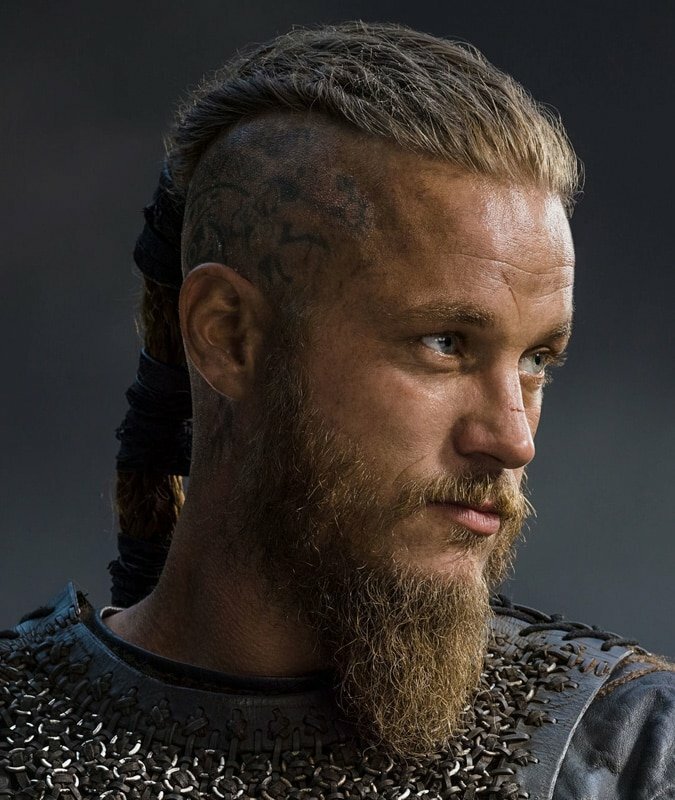 As seen on the show ‘Vikings’ king Ragnar Lothbrok, this style pulls long hair back into a single, thick warrior braid. If your workplace is more spreadsheets than pillaging this one may not be for you. 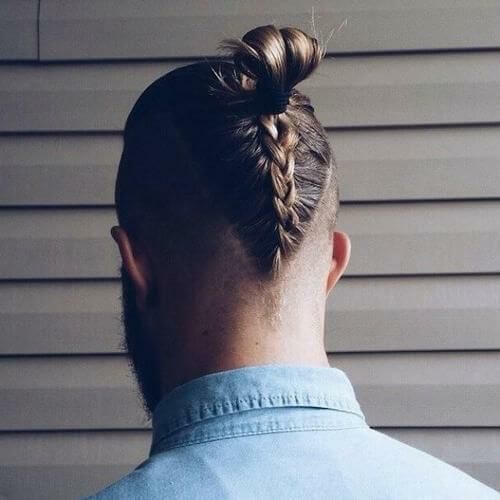 If you’re committed to your man bun, then introduce some texture by adding braids that run from your forehead into the topknot. Works well with one or multiple plaits. The twin shoulder length braids will have you looking stylish and slick. First seen on your 12-year-old sister, but now you can do it too. This plaited style makes a standard ponytail feel like you’ve actually put some effort in. 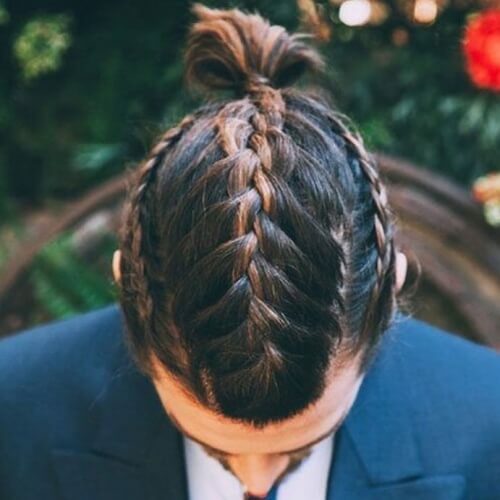 If your braids will be focusing on the top part of your head, you will most likely end them in a top knot or man bun. In case your hair isn’t significantly long, a top knot will do. Among styles of braids for men, two braids win by a long shot. They’re easy to get and complement most facial features. 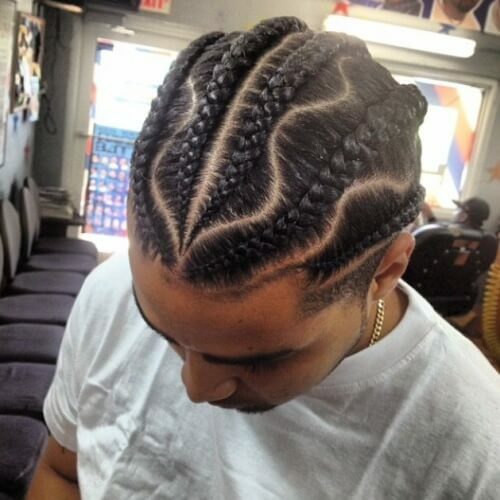 Nevertheless, you can make yours more complex by adding cornrows into the design. 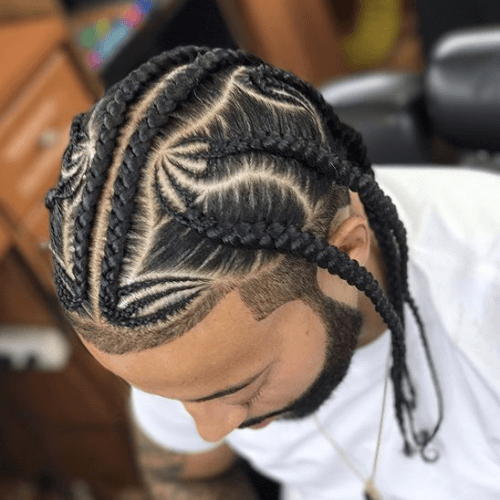 Not all braids for men have to be in the traditional 3-strand style. 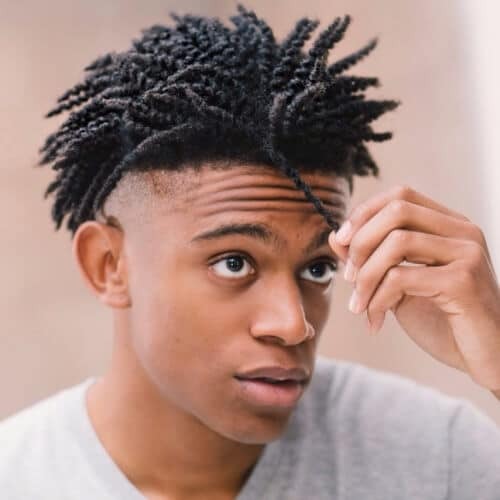 Twist are a much more natural looking way of styling your hair. If you’ve worked to obtain truly long hair, then why not show it off with some braids? 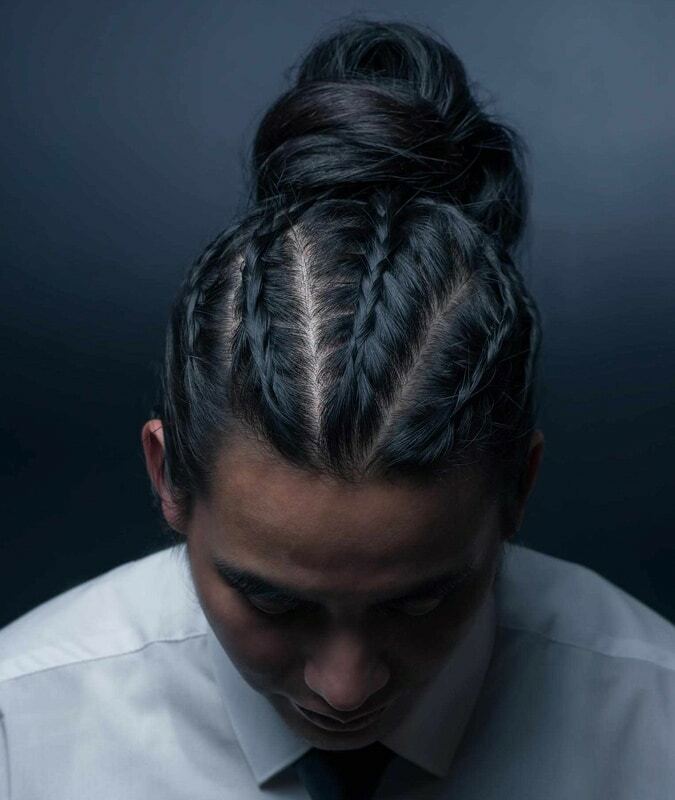 Long braids for men can be a great way of showing of your locks. 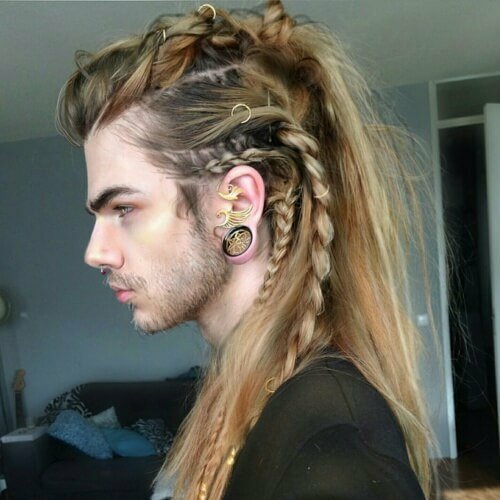 This unique style mixed braids and a man bun. But is styled with designs on the back and sides of the fade. 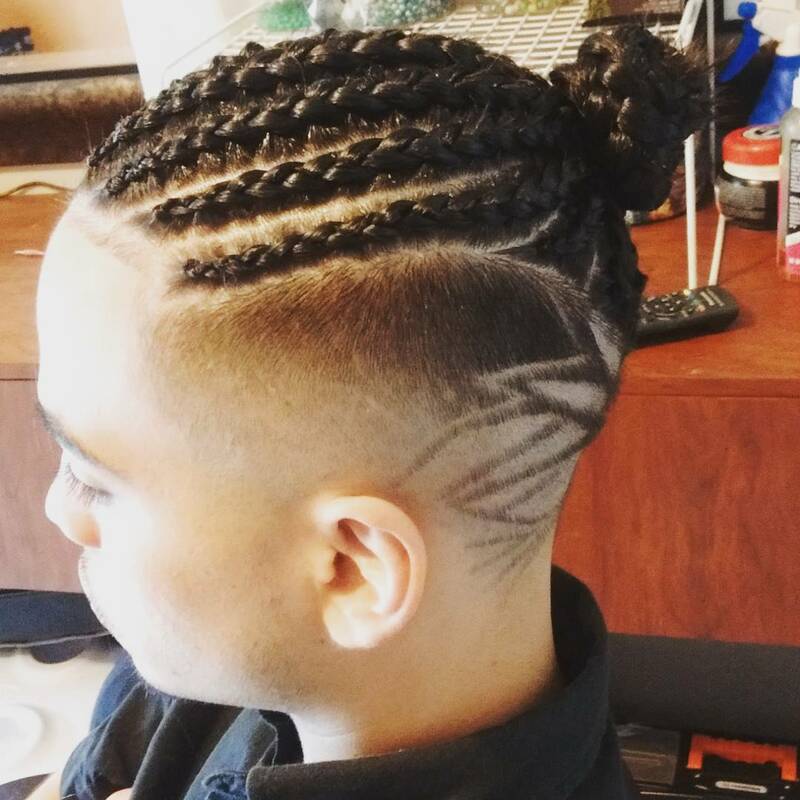 Braid your cornrows in a zig zag manner for a unique look. 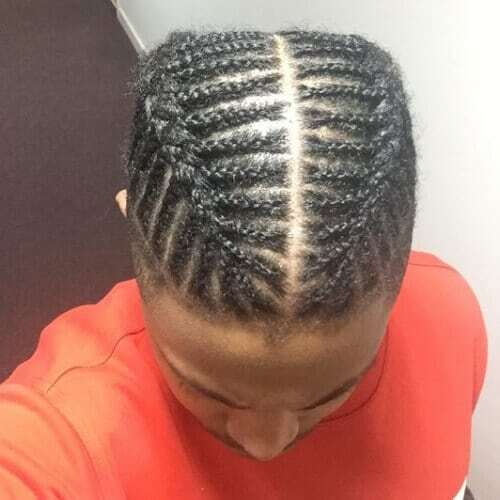 These long vertical cornrows are a nice way to keep your hair long and show off. Adding a beard to the equation makes everything more gritty. Putting your braids up in a bun can add a new depth to your look. 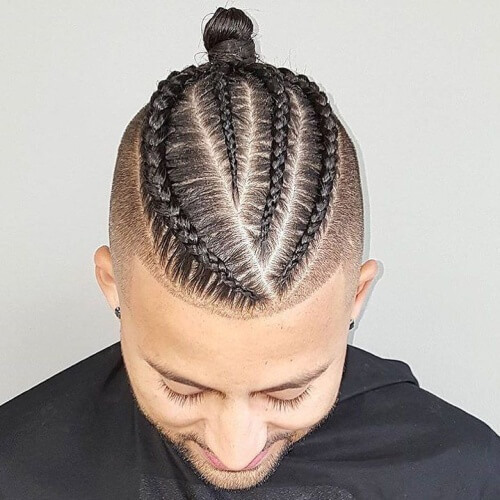 Just because your hair is long and braided doesn’t mean you can still get a box fade and keep everything looking crisp. If you want to step out the box with your braids. Try highlighting your hair. By adding metallic beads into your braids you can give your braids some more depth. Hair always looks longer after you braid it. 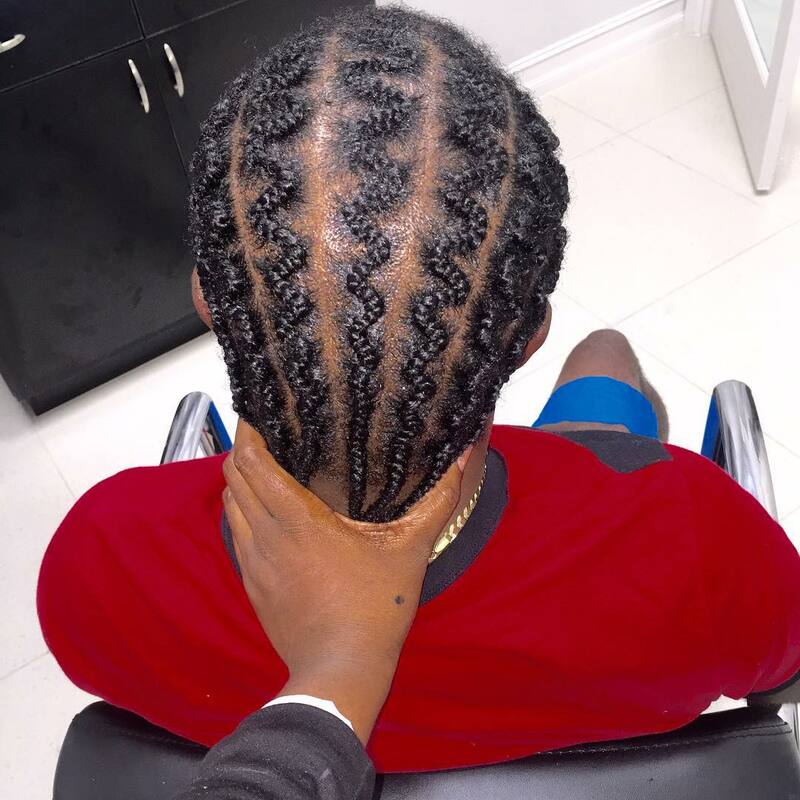 Even a short afro or short length haircut can be braided. So you have braids, you’ve tried having a bun. Why not have two buns? This can take your look to a whole other level. 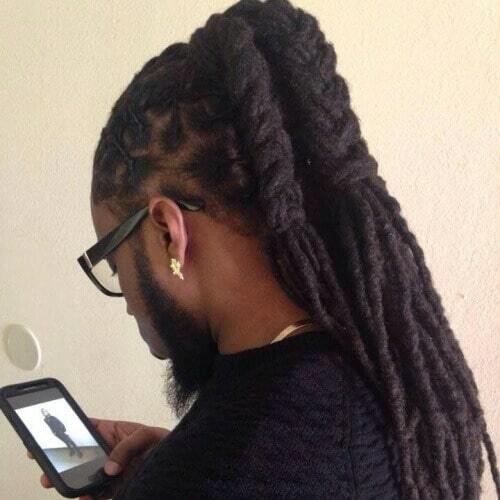 Dreads are a more natural style similar to braids. 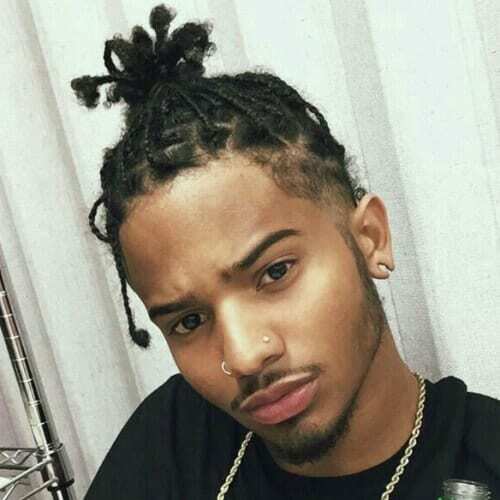 A Twisted dreads bun can give you a great look. 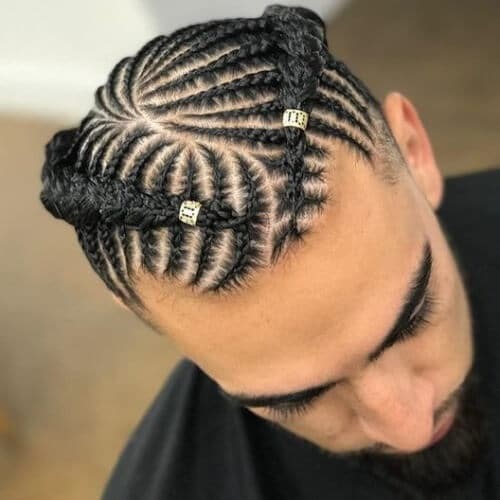 The most intricate cornrows can get boring. 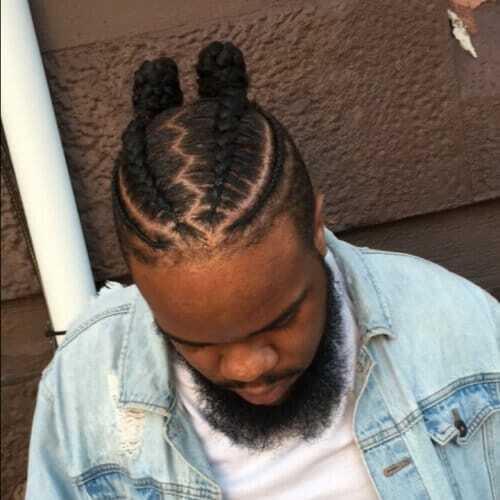 By adding two braids at the front you can experiment adding something new to the equation. Crown braids are a big trend at the moment. Making the braids follow the crown giving a whole new style. 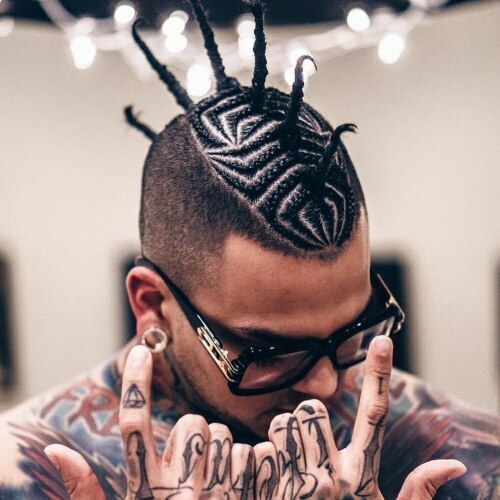 This look has 2 lines of braids acting as a mohawk. With long braids down the side. This shows how wild and experimental you can get with your braids. 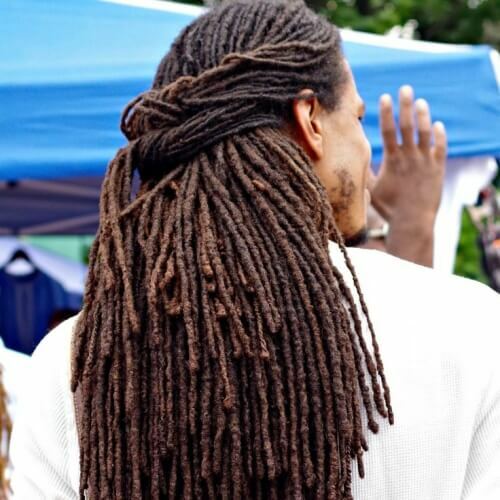 Dreadlocks make for an eye-catching hairstyle that also doubles as a powerful cultural statement. 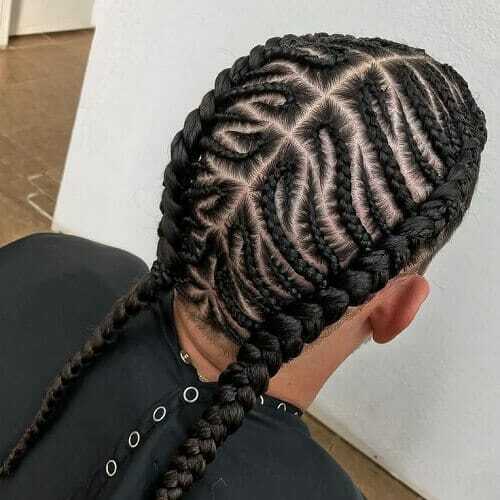 The Dutch braiding technique will help you achieve these results. 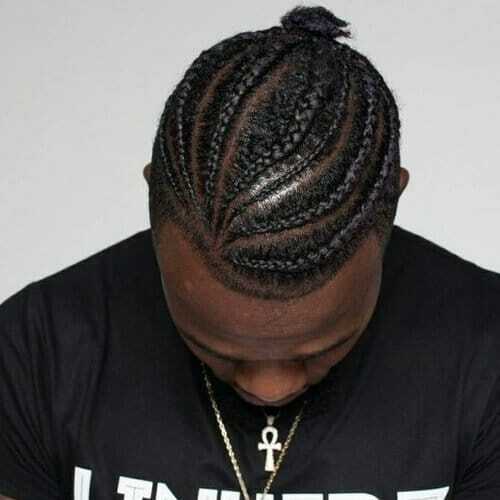 This style of braids is called the dutch boy haircut, but to African hairstylists it is known as the Ghana braid. 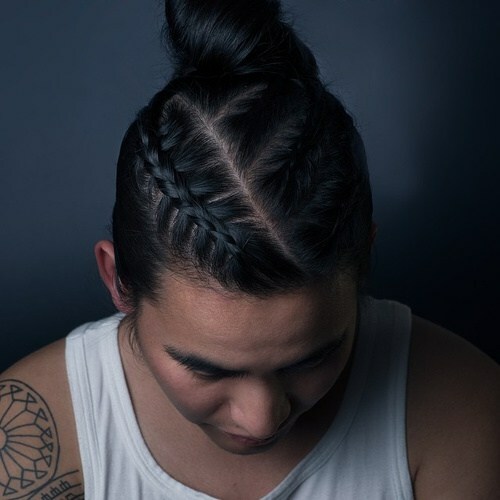 As far as braids for men are concerned, the fishbone method is widely embraced. Indeed, it does require longer hair to pull off, but the outcome is major eye candy. Want a bohemian approach for your braids? While dreadlocks are most likely the most popular choice, you can try a temporary method like the fishtail braid too. Think outside of the box when it comes to your design. You can intersect, intertwine or overlap your braids as you please. As you can expect, it will take longer to braid them, but you’ll be satisfied with the outcome. One of the most well-known new school rappers around. 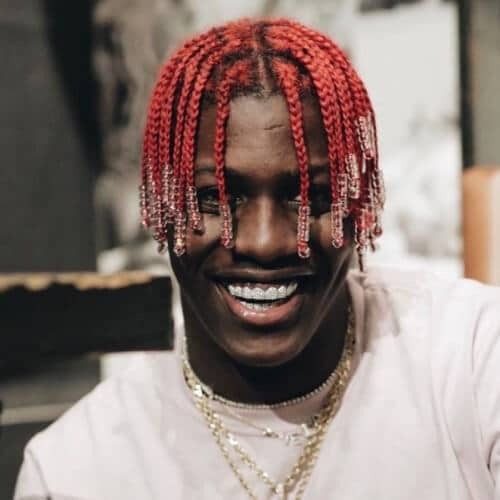 Lil Yachty and his unmistakable cherry red braids with clear beads have become a well known look and if your outgoing. 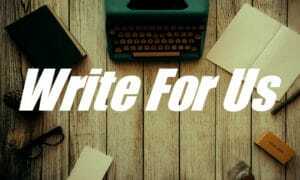 This will be for you. If you end up getting significantly long dreadlocks, it may be difficult to have them down all the time. 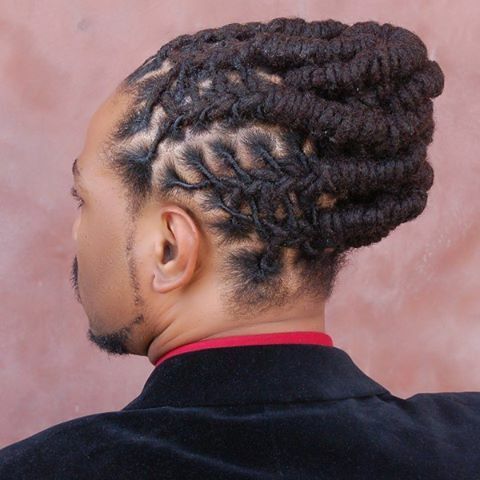 Instead, you can choose a braided hairstyle that involves wrapping your dreads in a ponytail. Coloured braids are something that have become popular with hip hop culture. 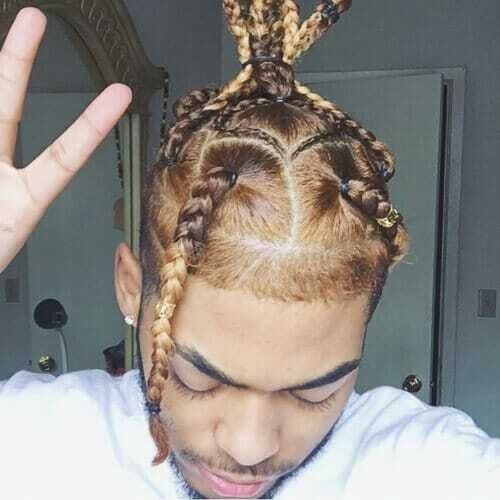 Ombre braids could have you feeling and looking like your favourite rapper. You can play around with a braiding style for a certain occasion. To nail the reverse braid, tip your head upside down, start braiding from your nape and end it in a knot. Not everyone may be up for long dreads, but short locs are always a great alternative. 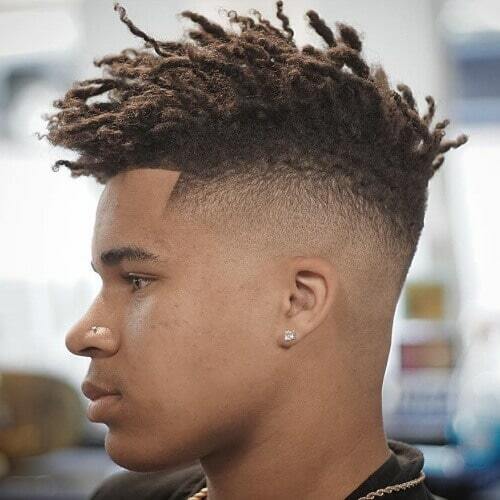 You can get a taper fade undercut and get dreads only on the top part. 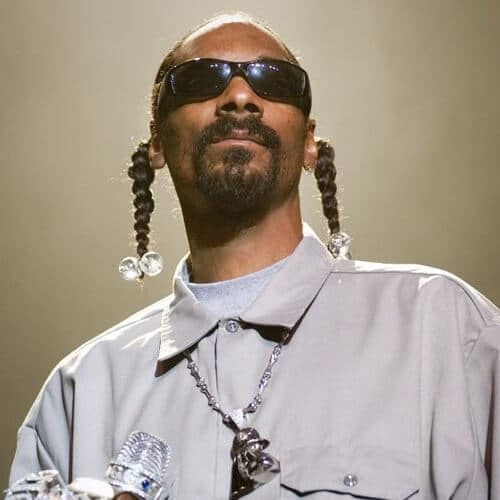 Hip Hop veteran Snoop Dogg has been known for sporting braids for almost 2 decades. 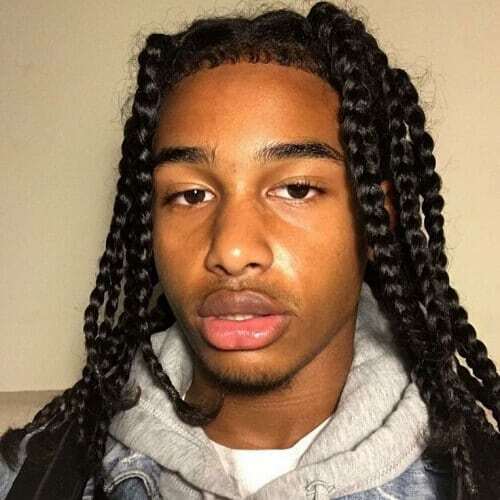 This iconic style of braids will go down in history. 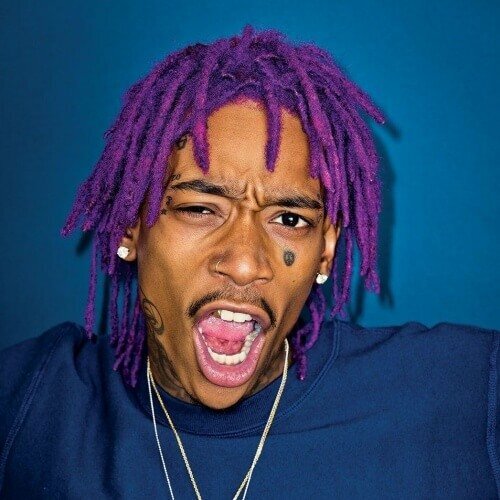 Rapper Wiz Khalifa is known for rocking all types of dreads, but in 2017 he decided to bring them to life with a color that’s impossible to miss. Maybe purple isn’t for you but another colour could have you sticking out from the crowd. Or in front of the crowd. 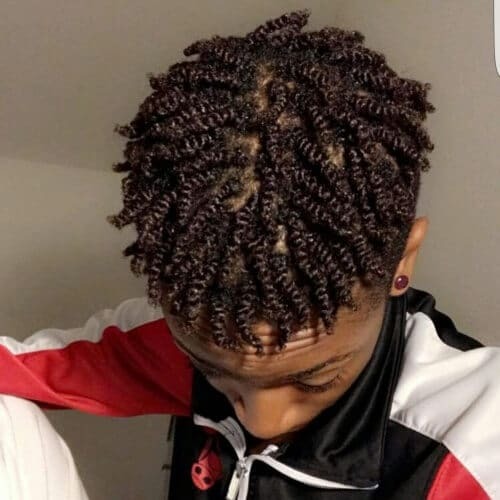 The two strand twists are a great way of advancing your short dreads. 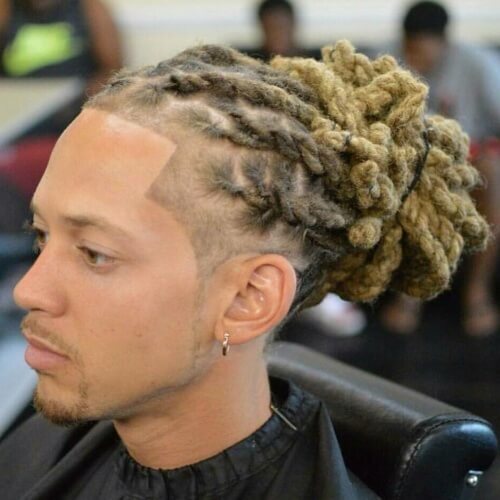 By twisting into each other you can evolve the short dread style. These viking braids are seems almost historical. If you want to go with something more bohemian or historical. This will be where to look. Although we can’t attest that the braids above are an actual representation of Viking looks, they’re definitely in that direction. By experimenting with the partings between your braids you can tap into many different styles. This wavy parting is easy to accomplish between your cornrows. The crown braids are usually from the front of your head. 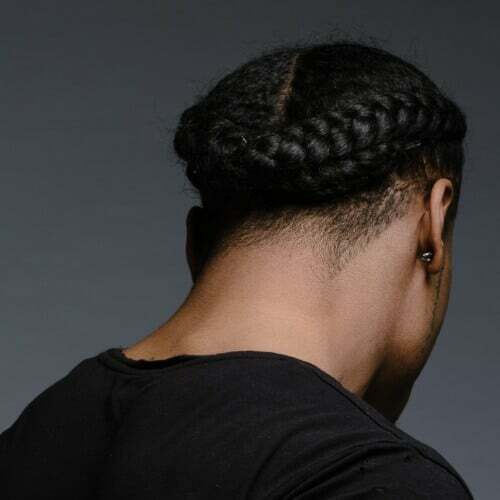 By leaving all the braids to the back of your head it can give a very different style to the popular hairstyle. When your hair becomes long enough many things become possible. Braided braids are an example of when you just have a lot of hair so you can try new things. Braiding your braids into each other is one of those things you should try. Locs are highly appreciated also for the broad range of hairstyles that spring from them. 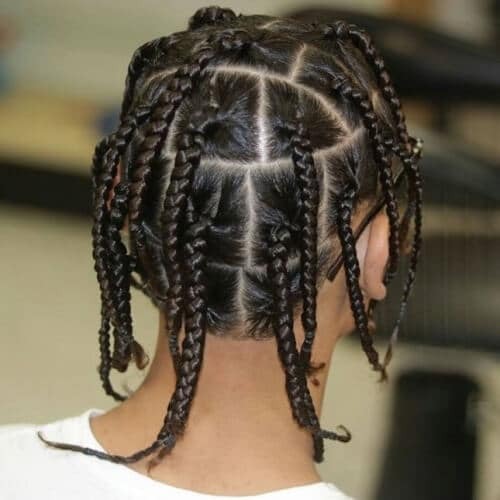 Just like you part your hair, you can also choose to get your braids in a certain direction. 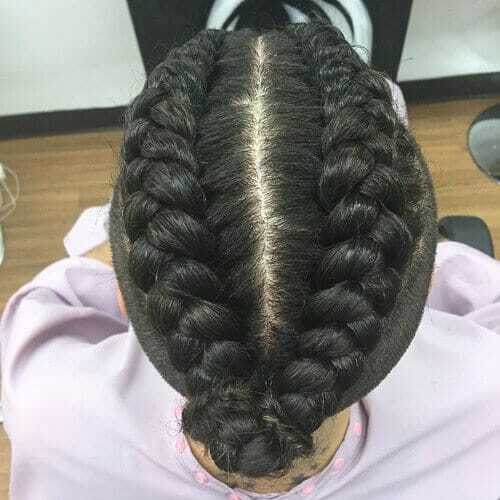 For instance, you can pick a particular point that you want your braids to start from and work your way through the rest of your head from there. 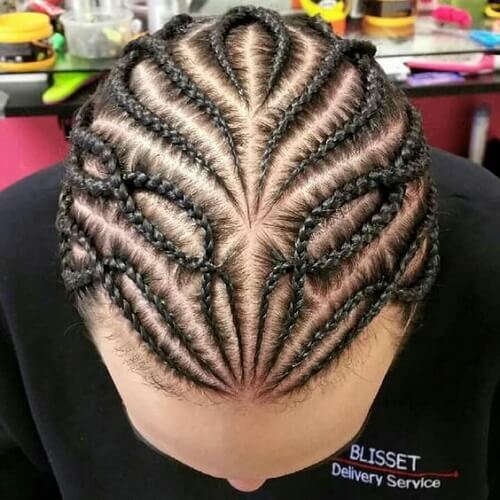 Dreadlocks are twisted into sophisticated centre box pattern. 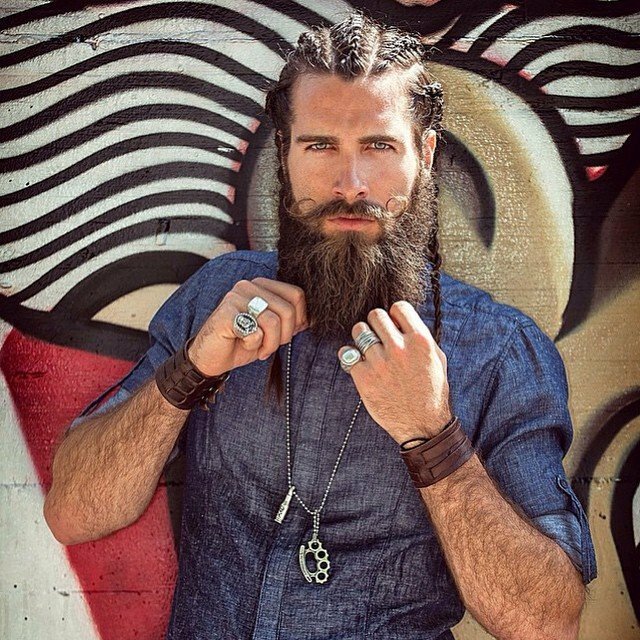 This look is great for men with long thick hair. 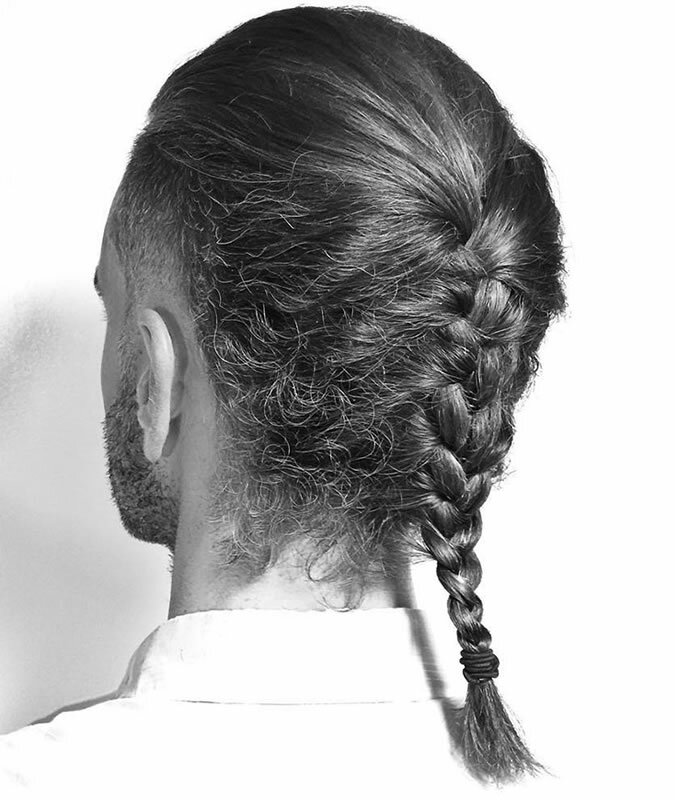 Adding three or 4 small braids into the mix can turn you into a viking. A topknot adds beauty to nicely braided hair. Done well can be a great look. What if you just want to try out some braids for fun? You can choose to braid only a small section of your hair and get cool results. Remember what we said earlier about braids and color? Well, this example should motivate you to get out of your comfort zone and explore bold tones. 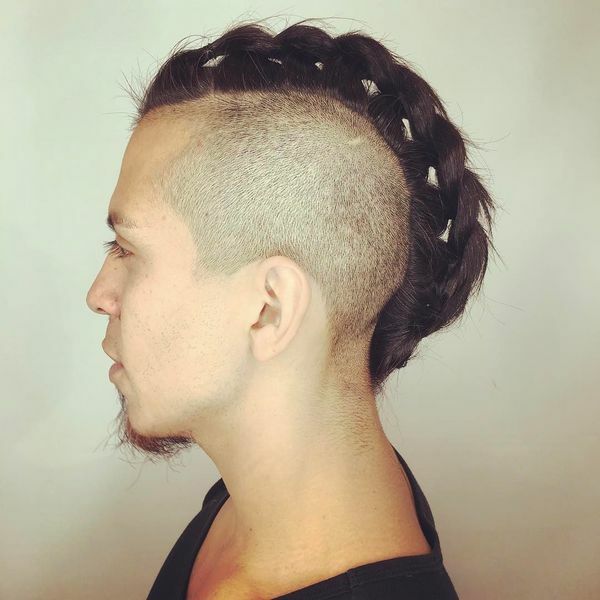 Use braids to create an edgy faux hawk effect. 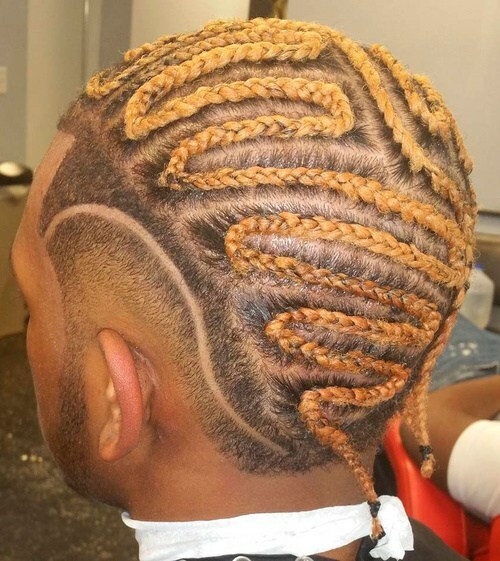 Blonde hair has been the trend of the last few years and braids leave no exception. 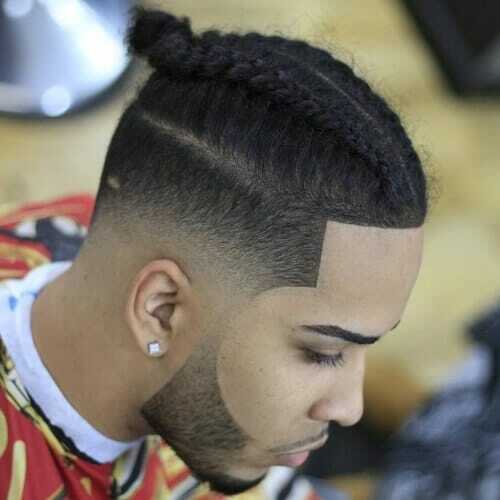 With shaved sides this looks brings more depth to the classic cornrows. Are you not afraid to make a cool and even extreme haircut? 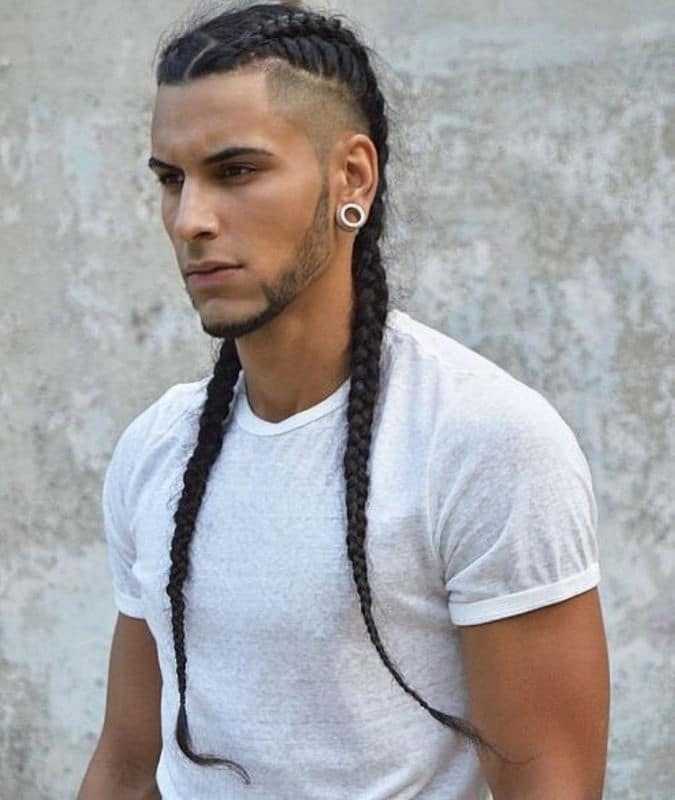 You should pay attention to these Mohawk Braids for Guys. Some would assume only women can pull this look but if you have long braids you should flaunt them. A unique take on a classic style. 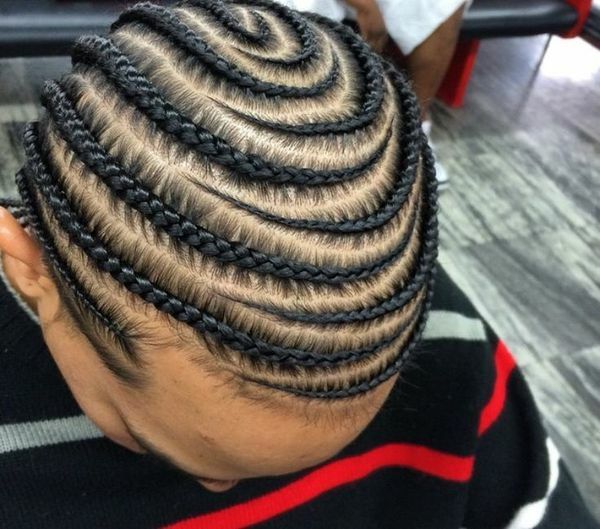 Spiral cornrows brings something new to the classic. So this goes to show that there are many different types of braids that one can go for. I am sure you will be able to find a style in this list of 55 haircuts that suits you perfectly. Don’t be shy though, experiment and see what you like the most. Here are what we think are the top 5 braid hairstyles from the list.